Use the Data Files window to work with files stored on the WebDAQ hardware (either internally or on external media), and upload or download files to and from your WebDAQ hardware. You can add and remove files, convert data to binary, csv, or UFF, and display saved data. Use the Files tab to manipulate files and directories on your WebDAQ hardware, or upload or download files to and from your WebDAQ hardware. For storage locations on your WebDAQ hardware, you can create or delete folders, select files for deletion or download (any file type) or for display or conversion (.wdd data file types). You can also upload any type of file to the selected storage location on your WebDAQ hardware. create_new_folder New Folder Creates a new folder in the selected WebDAQ storage location. Note that external media must be detected in order for the location list to include SD Card and USB Storage Device. autorenew Refresh Refreshes the directory list in the selected WebDAQ storage location. call_missed Up Navigate up the directory tree in the selected WebDAQ storage location. delete Delete Delete the selected directory and all of the files it contains from the WebDAQ storage location. file_upload Upload Uploads a file from a local drive to the selected storage location on the WebDAQ hardware. The maximum file size that can be uploaded is 150 MB. Note that the timestamp is set to the time when the file is uploaded. file_download Download Downloads the selected file from the WebDAQ storage location to a location on the local drive on the computer specified by your browser settings. Note that the timestamp is set to the time when the file is downloaded. delete_forever Delete Deletes the selected file from the WebDAQ storage location. Decimal Places: the number of decimal places to include in the exported data. Decimal Format: the decimal format to use when exporting data to a .csv file. Available options are Dot and Comma. Separator: the delimiter to use to separate each column of data when exporting to a .csv file. Available options are Comma (default), Semicolon, and Tab. Time Format: The mode used to indicate the duration of the acquisition on the x-axis. 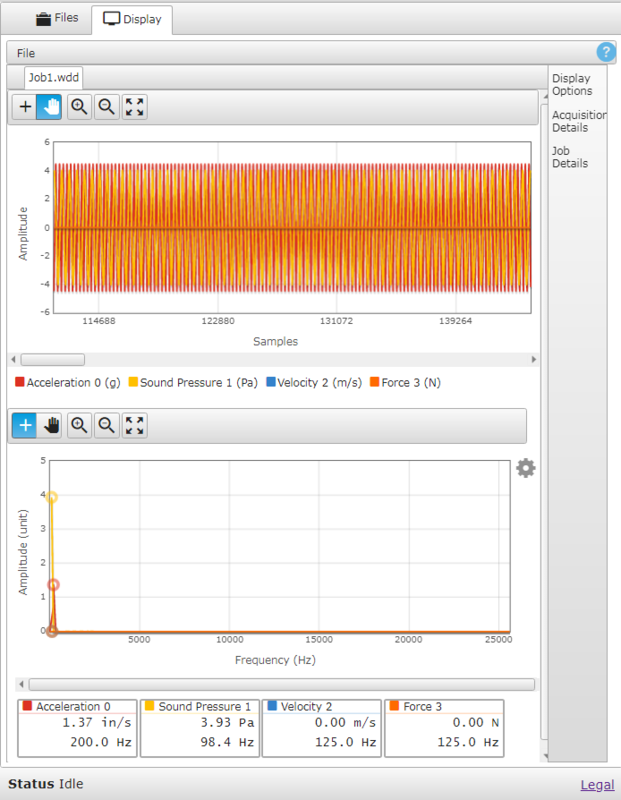 Select Absolute to display the x-axis based on the time of day when samples are acquired, or Relative to display the x-axis based on the time since the acquisition began. .uff(ASCII): exports both header information and data in ASCII text using Universal Dataset Number 58 formatting. Specify the data point precision (single or double), and each channel direction, if applicable. .uff(binary): exports header information in ASCII text and data in binary using Universal Dataset Number 58b formatting. Specify the data point precision (single or double), and each channel direction, if applicable. .bin: exports a binary file containing channel-interlaced double values; header information is removed. launch Open File Plots the selected data file on a strip chart, and switches the view from the File tab to the Display tab. Disabled when other file types are selected. If the file size is larger than the default buffer size set in the Preferences window a dialog box prompts you to select a range of data from the file to plot. 10 MB is the default maximum data set for plotting. Selecting larger sizes is not recommended. 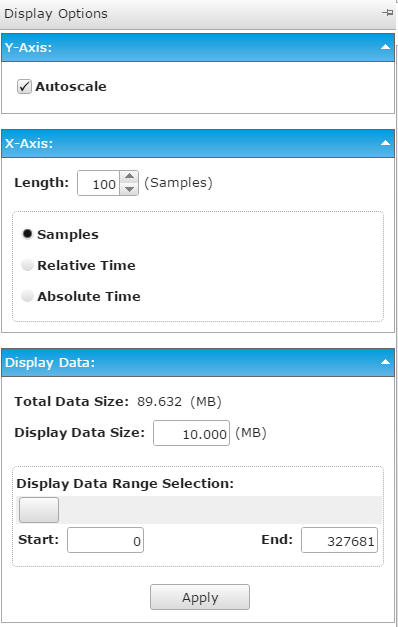 To view other data in the file, use the Display options panel on the Display tab, discussed below. Use the Display tab to open files and view saved data. When viewing FFT data, the maximum peak values are optionally displayed on the data plot and in the legend below the plot. The FFT size for display purposes is calculated based on the sample rate to achieve a resolution bandwidth of approximately 1 Hz. The FFT display is disabled by default when you zoom in on strip chart data. File Hover to show a menu used to open or close a data file in the data viewer chart. Open: Displays two submenus — Remote (WebDAQ) or Local, allowing you to choose a file to load into the data viewer chart. Select Local to open a file on the local hard drive of the computer or other local source, or Remote (WebDAQ) to open a file on WebDAQ internal storage or external media. Close: Closes the file currently open. Disabled when no file is open. add Select or Pan Selects a portion of the data viewer chart to display. Tap and drag a border around the area of the data viewer that you want to display. pan_tool Select or Pan Tap to freely move the display in the data viewer chart horizontally and vertically. zoom_in Zoom In Zooms in on the display using the center of the data viewer chart as the focus. You can zoom using the mouse cursor as the center point by double-clicking on the desired area of the data viewer chart. Zooming in on strip chart data hides the FFT data plot. Select the Display FFT Plot button to restore the plot to the FFT data set size and show the FFT data again. zoom_out Zoom Out Zooms out on the display. 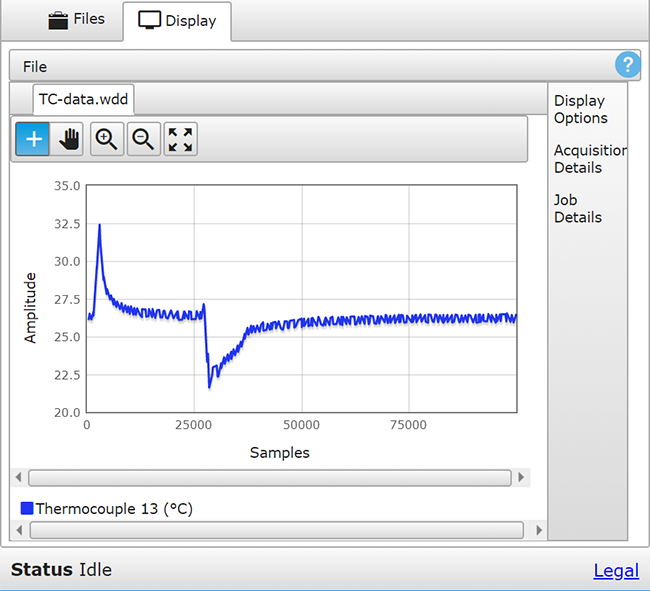 Display Options Opens the Display Options panel; use to modify X- and Y-axis scaling and to select the units displayed on the X-axis. If you are viewing a partial data set, a Data Range Selector dialog box opens for you to specify the data to view; enter the size (MB) in the Display Data Size textbox and use the scrollbar to select a range, or enter the range, the range in the Start and End textboxes. Tap the pin in the upper right corner to dock the panel so it is always visible; tap again to minimize. When viewing a partial data set from a file, you can change the range of data to view at any time with the Display Data panel; note that this panel is not shown when all of the data from the data file has been loaded into the plot. 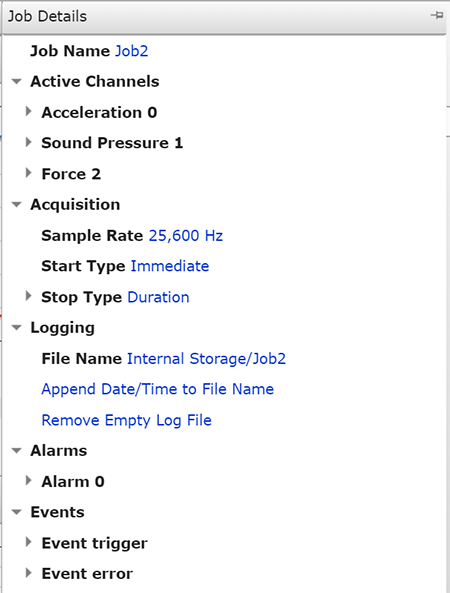 Acquisition Details Opens the Acquisition Details panel which lists the acquisitions settings for the data file currently being viewed. Job Details Opens the Job Details panel which lists the settings for the data file currently being viewed. When viewing FFT data, select the gear icon the on the FFT display to open the FFT Plot Settings dialog box. 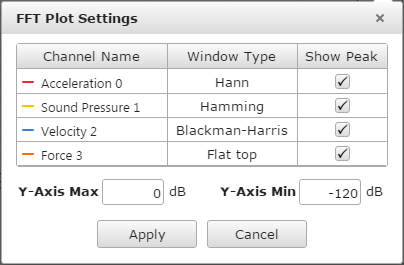 Use the options on this dialog to set the window type on a per-channel basis, show or hide the peak frequency on the FFT plot, and to set y-axis range values.